The fund, which had some rough initial years, has beaten the mid and smallcap fund category in recent times, although the outperformance is modest. The fund manager prefers quality, growth-oriented names with greater exposure to the domestic rather than global market, currently tilted towards economic recovery themes. The focus is more towards maintaining strong liquidity and ensuring downside protection rather than delivering high alpha–unlike some aggressive peers. This approach is also evident in its diversified portfolio with a modest exposure to even high conviction bets. With a lower standard deviation and better risk-reward profile compared to peers, this fund will appeal to investors keen on mid-cap play without the accompanying volatility. This fund is helmed by a highly skilled fund manager, but he has not been able to replicate the outperformance of his other funds when it comes to this scheme. This fund has visibly lagged behind peers in recent years, perhaps on account of its tilt towards larger-sized companies compared to other funds in its category. The fund maintains a compact portfolio of stocks, and although its top picks are prominent benchmark heavyweights, the rest of the portfolio has no resemblance to its benchmark. It has among the lowest turnover ratio, indicative of a strict buy-and-hold philosophy. For now, investors may look elsewhere with other options in the tax-saving category boasting of a much superior risk-reward profile. Although classified as a multi-cap fund, this fund is distinctly large-cap focused. It has been among the consistent outperformers in the large-cap category in recent years, with a healthy alpha (index outperformance). It adopts a value-conscious investment style, where the fund managers initially identify sectors which provide a contrarian play–priced cheap in relation to growth prospects–and then pick quality sectoral stocks that offer value on a relative basis. This value-driven approach is evident in the portfolio’s lower average market capitalisation compared to its category. While this approach is fraught with risk, the presence of a highly skilled manager and proven execution of the strategy should comfort investors looking for a large-cap fund. A short to moderate term maturity income scheme that invests in a diversified portfolio of debt and money market instruments. These have the potential to offer superior yields. Very often financial planners meet someone who intending to invest in stocks, bonds, real estate, mutual funds, gold etc.Such a statement clearly reflects that a large number of investors think that like stocks, bonds, gold and real estate, mutual funds are also an asset class which should be there in their portfolio. The reality, however, is that a mutual fund itself is not an asset class. Rather it’s a bridge to investing in various asset classes like stocks, bonds, gold, real estate etc. at a cost and risk which are usually lower than when an investor invests in these assets on his own. This is possible because say if an investor invests in an equity mutual fund, he is actually, although indirectly, investing in stocks. This is since the equity scheme in which he is investing has a portfolio of stocks which is managed by a group of individuals who have experience in investing and managing money. Investors in debt, gold, real estate and commodities could also expect the same. In India, though, real estate and commodity mutual funds are yet to be launched. Since mutual fund schemes are managed by a group of experienced investment professionals, the chances of them losing money compared to one who does not have much experience in investing in stocks, debt etc. are lower.In addition market regulator Sebi has also put in a cap on the total expense fee that fund houses can charge their investors in each scheme (maximum of 2.75% per annum). Mutual funds also offer better tax efficiency when compared with direct investing. One of the reasons for this is the government’s intentions to push retail investors to take the mutual fund route to investing. When planning ones finances there is a requirement to invest in various asset classes. In such a situation mutual funds turn out to be one of the best options to invest and achieve ones financial goals. Mutual funds are basically a means to invest in any asset class with several advantages to the investors. Mutual funds can be best explained if one compares it to a garden. In a garden there are many flowers and they are taken care by the gardener. In a similar way a mutual fund has many securities which are managed by a fund manager. This fund manager is concerned with generating returns for his investors and does not get married to a stocksecurity. This is a behavioural hitch while one looks at investing directly. He (fund manager) cuts all weeds (non-performing securities) and retains only the performing ones. One of the clear advantages of investing in mutual funds is diversification which leads to reducing the risks associated with investing. The common myth about mutual funds is that they invest only in equities. It is rather a tool which provides a pathway to invest in debt market, gold and even real estates. One of the biggest boons of a mutual fund is systematic investment which allows an investor to invest at regular intervals. This helps in rupee cost averaging which in turn helps investors get better risk-adjusted returns. All in all mutual funds turn out to be one of the best products for an investors to help him achieve financial freedom. It is however important that product selection should be based on proper research and after understanding ones financial goals and risk taking ability. Major banks, both private and public sector, recently revised their interest rates on fixed deposits (FDs). State Bank of India (SBI), the country’s largest lender, cut its interest rate to 6.50% for maturity periods between 3 years and 10 years. This is among the lowest FD rates in the industry now. The rate for 1-year FD stands at 6.90%. These rates are for deposit amounts of less than Rs1 crore. On 24 November, the bank also cut interest rates for bulk deposits—between 125 basis points (bps) and 190 bps—across various tenures. Bulk deposits are those over Rs1 crore and are usually made by companies or high net-worth individuals. 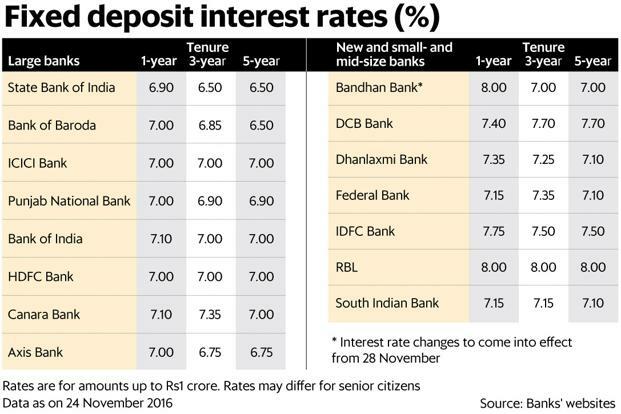 SBI has slashed rates for these deposits for different tenures. But cuts in bulk deposit rates would not impact the average retail depositors. The bulk deposits currently constitute only about 8% of the total deposits at the bank. In such a scenario, if you still want to invest in FDs, and plan to invest less than Rs1 crore, what should you do? Here’s a look at what to do with your surplus money. Apart from large public and private sector banks, We looked at FD rates across mid-sized and new banks, including a small finance bank (see table). On an average, among the top five public and private sector banks, 1-year interest rates stood at 7%, while it was 6.83% and 6.79% respectively, in case of 3- and 5-year tenures. For instance, 1-year FDs at ICICI Bank Ltd and HDFC Bank Ltd were 7% each. For new and mid-sized banks, the average FD rate for 1-year is over 7.52%. Their 5-year and 10-year offerings are at 7.44% and 7.39% respectively. Recurring deposits with 1-year maturity from Bandhan Bank Ltd and RBL Bank Ltd stood at 8% each, respectively. Increased liquidity on the back of rise in cash deposits by customers, due to the government’s demonetisation move, can be seen as one reason. According to the Reserve Bank of India (RBI), banks have received deposits in excess of Rs 5.11 trillion since the announcement. A large chunk of these deposits have been in savings accounts and banks will have to give a minimum of 4% interest on these deposits. The influx of cash in such large volumes also means that there are more funds to be lent to customers. This is an indication towards a cut in the lending rate. A cut in lending rates is preceded by a cut in the deposit rates. The relationship between deposit rates and the marginal cost of funds based lending rate (MCLR) is such that a decline in deposit rates results in decline of the MCLR. And MCLR determines the lending rate for the consumers. Banks have to announce an MCLR every month. Repo rate cuts in the past monetary policies, and greater liquidity too, have led to a fall in deposit rates. In this case, the lower rates indicate that banks probably have enough liquidity for that particular tenure. Interest rates of FDs could be headed further downwards. Sadagopan expects RBI to cut key rates. Accordingly, the interest rates on FDs are also set to go lower. But before that, factor in the real rate of return as well as the post-tax return in these cases to decide where to invest. FDs do not look lucrative as an asset class right now. For savers, this is bad news. Interest rates in FD are going to go lower unless the inflation trajectory changes. It is a big blow for pensioners as well. However, if you still wish to invest in FDs, you should do it immediately and you must lock these funds for a longer term of 3-5 years. If you fall in the highest tax bracket of 30.9%, then 6.5% annual return from an FD would get reduced to a return of 4.49% post-tax. Now, let’s factor in inflation, say 5.28%—the average Consumer Price Index based (CPI) inflation from September 2015 to September 2016. In this case, a post-tax return of 4.49% for individuals in the highest tax bracket will translate to a negative return figure of -0.79%. Similarly, if you are in the 10.3% tax bracket, then your post-tax return will be seen at 5.83%. With the average inflation figure, the returns here would be 0.55%. Some new banks and smaller financial institutions are offering a slightly higher interest rate than the top banks. You can check the rates from various banks and then take your pick accordingly. You can go to individual banks’ websites to check these interest rates for different tenures. Alternatively, you can also consider investing in a debt fund.